Deborah A. Harris and Patti Giuffre. Forthcoming (2015). Taking the Heat: Women Chefs and Gender Inequality in the Professional Kitchen. New York: Rutgers University Press. A number of recent books, magazines, and television programs have emerged that promise to take viewers inside the exciting world of professional chefs. While media suggest that the occupation is undergoing a transformation, one thing remains clear: being a chef is a decidedly male-dominated job. Over the past six years, the prestigious James Beard Foundation has presented 84 awards for excellence as a chef, but only 19 were given to women. Likewise, Food and Wine magazine has recognized the talent of 110 chefs on its annual “Best New Chef” list since 2000, and to date, only 16 women have been included. How is it that women—the gender most associated with cooking—have lagged behind men in this occupation? 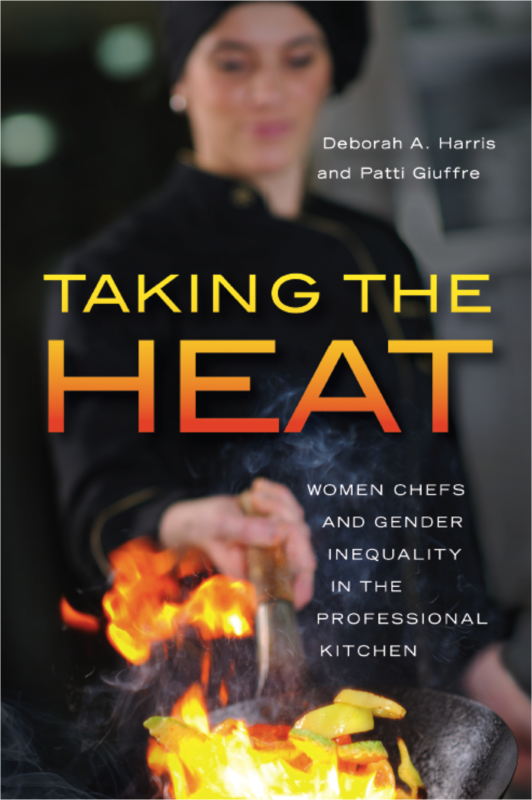 Taking the Heat examines how the world of professional chefs is gendered, what conditions have led to this gender segregation, and how women chefs feel about their work in relation to men. Tracing the historical evolution of the profession and analyzing over two thousand examples of chef profiles and restaurant reviews, as well as in-depth interviews with thirty-three women chefs, Deborah A. Harris and Patti Giuffre reveal a great irony between the present realities of the culinary profession and the traditional, cultural associations of cooking and gender. Since occupations filled with women are often culturally and economically devalued, male members exclude women to enhance the job’s legitimacy. For women chefs, these professional obstacles and other challenges, such as how to balance work and family, ultimately push some of the women out of the career. Although female chefs may be outsiders in many professional kitchens, the participants in Taking the Heat recount advantages that women chefs offer their workplaces and strengths that Harris and Giuffre argue can help offer women chefs—and women in other male-dominated occupations—opportunities for greater representation within their fields.